The other day we were watching a movie of a WWII battle and when one of the guys stood up and started spraying the field in front of him with bullets the guy next to him grabbed him and pulled him to the ground. Then he said “What? Do you think you are immortal?” Well, there it was “immortal” and it got us thinking because we have seen that word before, but never though much about it until now. The dictionary has im-mor-tal as “Living forever, never dying or decaying.” We would hope decaying is not an option because we would not want the zombie look as we go though our many lives. In past posts we have explained our belief on reincarnation and that is immortality for our souls on a spiritual level, but what about a physical level? So now we wondered if we knew anyone that is immortal. So we thought about it and we don’t ever remember anyone of our friends or acquaintances ever telling us they were immortal. But just because they didn’t tell us doesn’t mean they aren’t, they might be hiding it. So how can we tell if one of them is and they are nor saying? So we decided to start dropping hints like when one of them was speeding down the freeway we would say “Do you think if one of the oncoming cars jumped the divider and hit us head-on would be killed instantly?” They always say “yes”. So we decided to flat out ask “Would you want to live forever?” Answer always “no”. Now maybe they are immortal and they don’t know it? We have some other questions like do you get to choose the age in which you start being immortal? We have to assume the minute it kicks in you will go though eternity the exact age you are at that moment. We guess you will know when you are because you will cease aging and look the same day after day forever. (We hope the letter comes). We think our fiends would notice that you are not changing physically or that you are out living everyone, then again maybe not. So let’s say you are immortal and a massive asteroid slams in to the Earth and completely obliterates the planet into a bazillion little pieces of dirt floating around in space. There you are floating in space with all that dirt forever? 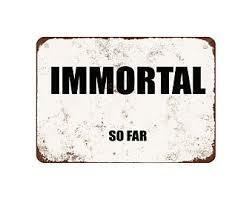 Come on folks, the Earth is eventually going to stop functioning but your not if you’re immortal. So then what? Does it mean that every atom down to your DNA heals and stay healed? If you’re older you might be taking prescription drugs so will you continue taking them forever? We would assume the healing would take place. We guess we will be pondering this for awhile, but right now we say “no” to immortality until we have way more answers to our questions. 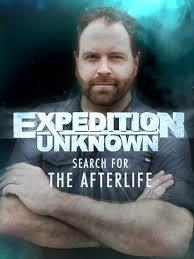 Good old Josh Gates, one of our favorite shows. We have been on many journeys with Josh and he and his team are some of the best. He has done two of these episodes followed by two “after the search” episodes. He started the first episode by sitting in Church but as we all know, that is not where to look. So he went to meet a archaeologist at the city of Hierapolis where there is supposedly a gateway to hell. As it turns out they found bubbles coming up in the pool once you go inside the cave. Who or whatever went in side would die of what turns out to carbon dioxide poisoning, which the bubble brought to the surface. Now we have to say at this point we thought Josh is going in the wrong direction because this has nothing to do with the afterlife other than death by breathing the carbon dioxide. So we waited for the next subject. This time he skipped past a bunch of different religions and finally settled on being in a choir the Mississippi Mas Choir which is Josh’s way of odd humor. So he is in church singing away, in a Christian church. After a few minutes of his antics he is off to New York City and meets a doctor at N.Y.U. Hospital where he investigates N.D.E. (Near Death Experiences). We had one but were not in his interviews. Most of the people were in a hospital when they had theirs. N.Y.U actually investigates NDE’s with electronic devices in the operating room. 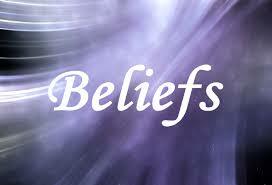 They have found that consciousness does not die when the body fies. The testing goes on at N.Y.U. Then he interviewed five NDE people that passed in various kinds of accidents. All of these people said the same thing we did in our NDE post which was feeling wonderful and feeling of God where they were. One of the people was told that he oldest sons coming death who was nine years old and was going to die soon – his eighteenth birthday. She told him and he in fact did die on his eighteenth birthday from a car crash. All five like us experiences the “tunnel” with spirits and feeling love and peace. Then off to Hollywood to meet Chip Coffey a famous medium (Talks to dead people) and attend a reading in a cemetery. He reads some people that attended and then called on Josh. Josh was obviously nervous, but did allow Chip to continue. A typical Josh usually does, the reading continued on the next episode of “After the search”. Josh asked Chip how he does the reading, but of course its more like a voice is in his head. (This can be learned and could be an ability you don’t know about). When asked about the afterlife he said it’s a place to go and learn and a place shared by many people. Chip had told Josh and Josh’s wife that their baby was going to be very late at birth, but when the contractions started go immediately to the hospital. They did and the baby was born nine minutes after they arrived at the hospital. Then Chip continued on with Josh’s reading from the prior episode. He said to Josh “you had a death in your family recently.” And went on to say her name was Maddie, Josh’s Dad’s sister. He had a store that sold native American items and arrowhead seemed to be the subject. She had given Josh an Arrowhead tomahawk! (He showed it). Then Chip did a reading on one of Josh’s crew and said there is a female knowing on the door and it’s a spouse that died quickly. He was married three months and she dies of a brain injury. She is happy he went on with his life. This weeks episode highlights are Josh traveling to India to experience the cremation at the Yangtze river, Josh being a participate of an exorcism and discussing the entire process, and Josh doing a hypnotic past life regression. (We talked about our regression in a previous post but it was done with a guided meditation by a lady from England. Her style was completely different also). The above is only highlights of the episodes because they are chuck full of details. If you follow us you know that anything that comes from an organized religion does not really mean much to us, but we do believe is the afterlife and we call it the “other-side” but both are the same. We are looking forward to his coming episodes and we found this to be an excellent documentary on the subject. Josh seems to always do a good job on anything he goes after. Quick Review- “Mega Monsters – Yeti the new evidence” Total Bull Crap. This guy visited every place all the other seekers have visited around the world and there was absolutely NOTHING new. Waste of time! We have nothing to report except that we thank everyone for stopping by. One quickie, we did see a UFO the other night out our second story window. Two read lights side-by-side and it went straight up from the ground to about 1,000 feet and stopped on a dime. Did a 45 degree angle rise to about 1,500 and stopped. The as it sped away to the south east we could see a green blinking light on the rear. No it wasn’t an airplane. If went from a dead stop to about 1,000 mph in a heart beat and it was completely silent. We think over the next year this will become a standard event all over the country. Peace, Love, and Light to all. There will be a day when we will be done with our path and our physical body will come to and end. We don’t know when or how, but because we have experienced a NDE (Near Death Experience) we do know what the other side is like. We know that our soul will go to the other side and we wish to have our physical body cremated, unless we die in a fire, then it will automatically be cremated. We also will make sure that our thoughts and last thought will be of God and a peaceful passing. We have had some close calls throughout our life and each time something always saved us at the last minute. We believe that it was the work of an earth angel a few times. When we were 10 years old and stuck in quicksand with a friend, a man came out of nowhere to pull us out. We were in a place that was desolate and even my friend said he did not see the guy, but all of a sudden, this man pulled us out at the last minute. We barely had time to thank him and he said he had to go and left. Then there was the time we were riding in my friends 1964 Corvette and I was sitting in the middle and one friend was driving and one friend was in the passenger seat. Yes, a Corvette is only a two seat car, but since we were in our late teens and invincible, the middle arm rest seemed fine as a seat. So we were going down I-94 East Bound at around 120 MPH in the left lane passing a bunch of semi-trucks when one of the trucks ahead decided to pull out into the left lane where we were. The driver could only do one thing to avoid a collision and that was to turn left and go into the middle grassy separation. We were throwing grass all over and slowly slowing down when we all saw one of those Police “Turn around” roads coming up soon. Lucky the “road” had dirt on both sides almost like a ramp. When we hit it we immediately launched to the right and landed in the left had lane of I-94 like nothing happened. We got off at the next exit and pulled in to the first parking lot and came to a stop. On the passenger side there is a horizontal bar over the glove box called a “suicide bar” and we had to pry the hands of the passenger off the bar. Nobody wet their pants but it made a great story to tell our friends. There was one time when we had just soloed when I was taking flying lessons and my instructor had me doing touch and goes for practice. A touch and go is a landing and then without stopping, giving the plane full throttle and taking off again. It happened to be at Gary Airport and on a right turn out it took me over Lake Michigan for my downwind that day. Then the tower called me and had me execute a 360 degree turn because another airplane was coming into my air space without permission. At the time we were about 2,000 feet over the lake and the request shook me up, but we started the 360 to the left and found we were having trouble maintaining my elevation. We were going down so we gave the plane more gas, but it didn’t help. We admit we started to panic when we were at about 1,000 feet above the water when all of a sudden we felt at peace, calm, and our mind cleared. We immediately saw that we had left our flaps down and we knew that we needed to put them up, but we had to do it slowly to prevent a stall. When we stated bringing the flaps up we started gaining altitude so we cut down on our speed and got the plane under control. We turned on “base” and then “final” and landed. I was shaking and got to the terminal as fast as possible. Just as we stopped our instructor ran up and asked if we were ok? He heard the tower ask us to do the 360 and knew that we had not covered this yet in out lessons so he ran out to the tower to view or progress. He said that when he saw us go lower than the building between the tower and the lake we were having an issue and tried to call us on the radio but got static. The he saw us rise and knew were ok. I told him it scared the crap out of me and it cured me from keeping my flaps down to long on a touch and go. We both laughed and we drank about four Pepsi’s down in five minutes. To this day we love to fly. We used to fly commercial often and have been on many “Emergency” Landings, but we always had confidence that the pilots we well trained and we knew they were well trained. Usually the person sitting next to us got very nervous, but we would always assure them we were in good hands. This always seemed to calm them down. Every once is awhile before take off the person sitting next to us would ask us to hold there hand because this was the first time they where flying and they were afraid. We always said yes, of course. They were mostly ladies because the guys we noticed were chugging down beer during preflight. Of course there are times we all come close to death but we don’t know it. So we go on with our great lives and know that God is always watching out for us. We look at death as the completion of our path in this life and we know that we can take what we learned with us to the next life (See post on reincarnation – May 20). Recently we were shook up by the suicide of Anthony Bourdain, someone we followed for many years. In our teaching we have learned that a person who commits suicide will experience the same exact situation as when they passed. Suicide is an issue in the US and there are many organizations that have suicide help lines. The national Suicide Help line available 24/7 is 1-800-273-8255. Please call, you are NOT alone and we care about you. We have nothing else to report at this time and we thank all of the folks following our posts. We hope to make a better life for all and we certainly willing to share with everyone. Just know that you are not alone and that we all care for you always and in all ways.